A group with a big eye with the shape of a rectangular six, is alive except for rectangular six in the corner. 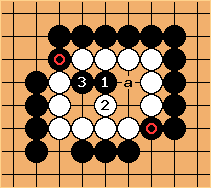 Here, the eyespace has three on the side, but in the center or with two on the side the implications are only better for White. The vital points are b and w and they are miai for life with six points. lives via a or b: If Black plays one of them, White responds at the other. at would only threaten to make seki rather than to kill, and would be Black's last threat here since White's reply would be at . makes miai of a and b for Benson-life with six points. Accordingly, Black only has one more ko threat here. Furthermore, that threat is just to make seki rather than to kill. There are two cutting points (induced by ) in the otherwise ordinary looking rectangular six. Notice that one of the two chains has no outside liberties at all. The status of this group is actually unsettled. If Black plays first, White can be killed. The Chinese calls this 断头板六 (literally, "decapitated" rectangular six). Black can kill by playing the placement at and then cutting at . 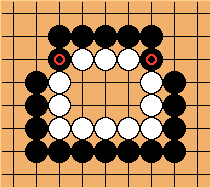 Owing to shortage of liberties, a White move at a would be self-atari, so White can no longer form two eyes. On the other hand, if the rectangular six group has two cutting points as shown, then it is still alive. The comb formation is essentially a rectangular six with two cutting points of this form. Life and death can be so strange.